Thanks to Gareth Randall for the info on Peter Hawkins and Threads. Public Information Films are commissioned by the government to tell the nation about things they should know, how to behave and generally state the bleeding obvious. I remember when I was growing up in the Seventies, watching Saturday morning television (bring back Tiswas!) and being subjected to these gems in the commercial breaks. Nowadays, of course, children's television is rubbish and ad breaks are filled with adverts for crap toys, sweets and burgers. To see a PIF today you have to watch the breaks late at night or very early in the morning on ITV1 and Channel 4 when they can't sell the advertising space! 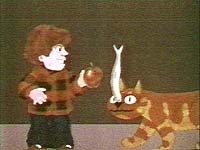 Perhaps the best well known PIFs were the series of animated cartoons featuring a little boy and his wise cat, Charley. Six films were made (Matches, Falling in the Water, In the Kitchen, Teapots, Strangers and Mummy Should Know) in 1973. In each the moral of the story was told by the cat (voiced by the late Kenny Everett) and then translated into English by the little boy. "Charley says you shouldn't go off with strange men or ladies you don't know." 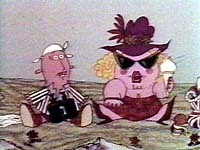 Another well known cartoon series, probably the most hilarious, featured the amazingly ignorant Jo and his wife Petunia. These became so popular (they should have been given a series!) that they were killed off in their last film. There were four films made between 1968 - 1973 (Coastguard, Water Safety (Flags), Acceptance of the Country Code, Worn Tyres). The voices were Wendy Craig (Butterflies) and Peter Hawkins (Original voice of the Daleks, Bill and Ben the Flowerpot Men and Captain Pugwash). Brigit Forsyth took over the role of Petunia for their last outing.
. You can also purchase the titles directly from the source - Network. They also sell other TV titles such as Robinson Crusoe, Catweazle, Rentaghost, The Goodies, Crossroads and The Sweeney.